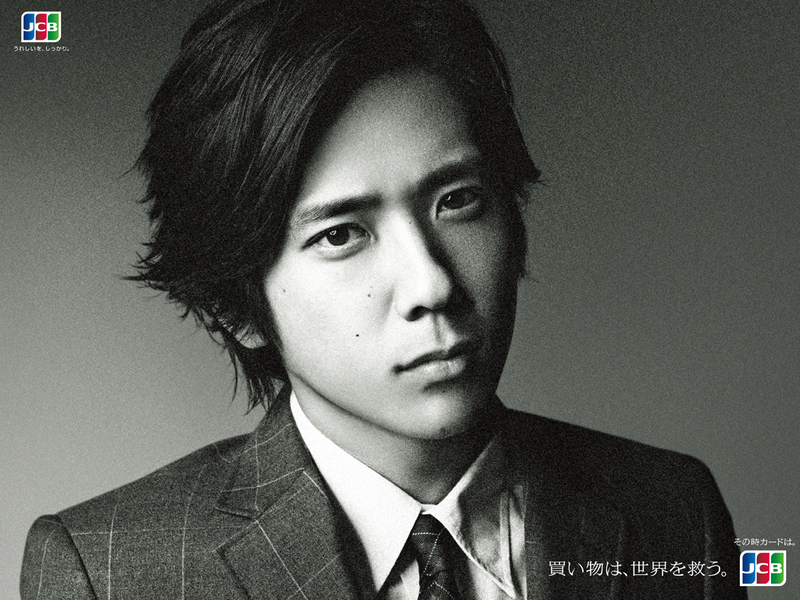 It’s the 31st birthday of Arashi’s resident brat, Ninomiya Kazunari, also known as Nino, Neen, Kazu, Ninomi, Hollywood Sturr, Clint Eastwood’s friend, national gamer… and the list goes on and on. But even if he is three decades and a year older, he will forever be 17. So on the occasion of his 31st birthday, I’m listing down 31 reasons why Mr Sexual Powerhouse is lovable. 1. He’s a brat. 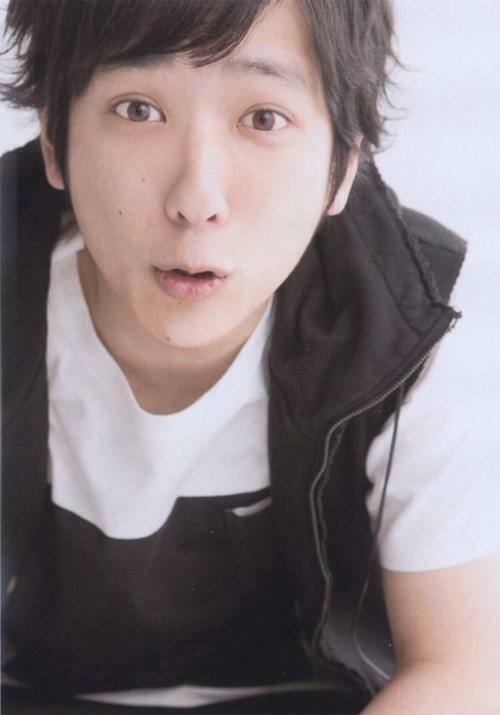 Hear him whine on Arashi shows and scream “yamete!” and you’ll know what I mean. 2. He’s stingy. He claims he doesn’t bring his wallet to work because there are four other people who do anyway and will pay for his meals. 3. He’s, erm, fashion-forward. 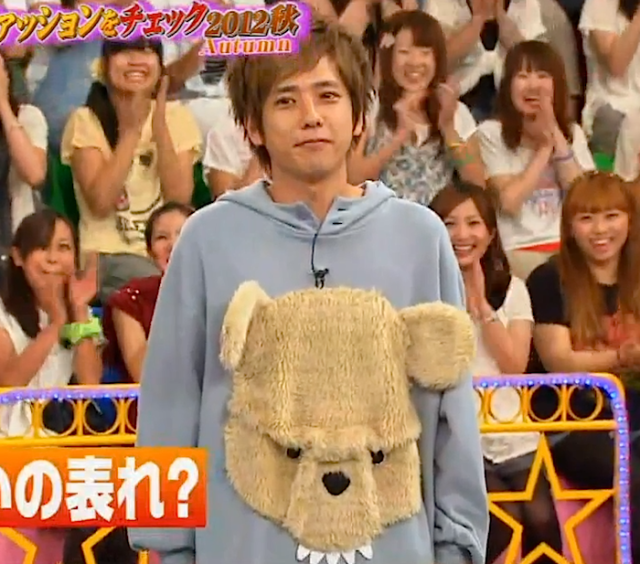 No less than Arashi’s fashion icon. 4. He’s cocky. Who can claim in front of Emma Stone, Jamie Fox and Andrew Garfield that he’s a Hollywood Sturr and Clint Eastwood’s friend? And yet sound hilariously adorable? Oh he’s not lying, by the way. 5. He’s a game otaku. Don’t we love otakus who give Nintendo games, which he endorses, to his bandmates as “gifts”? 6. He’s a good actor. Nino is a natural actor. Oh, and once those tears start flowing down, you can’t stop. 7. He is not afraid to make fun of Jun and gives the poor guy nicknames from J, Don Matsumoto J, Yakijun, J-san and my personal favorite: Junpon. The nicknames deserve a separate blog post in itself. 12. 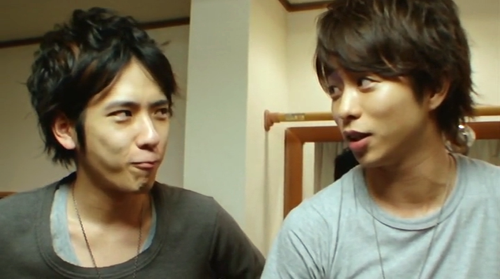 The way he obviously loves Aiba even if he bullies him. 14. All those hilarious rumors about him and his girls. 15. 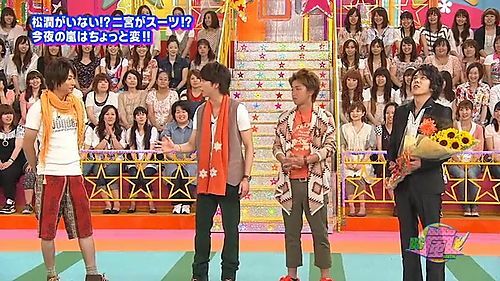 His magic tricks that he always uses to charm their guests on SHIYAGARE while the rest of Arashi smirk knowingly (they’ve probably seen him practice those tricks so many times they can already do it themselves LOL). 16. The way he laughs at Sho’s jokes. Including the, uh, not so funny ones. 17. Nino and songwriting. He wrote FIGHT SONG, 1992*4##111 (from Boku no Miteiru Fukei), どこにでもある唄 (from Beautiful World) それはやっぱり君でした (from Popcorn), 20825-Nichi-me no Kyoku (from LOVE), Sketch (co-written with Sho), among many others. 18. His sharp wit. Yes, he sounds like a brat, looks like a brat and whines like a brat. But he is sharp-witted. 19. His dry sense of humor. He is H-I-L-A-R-I-O-U-S.
21. His posture. Though it’s sad because it is caused by his bad back but it gives him an endearing aura. 22. His low tolerance to alcohol. How to take you out, Neen? 23. The way he is portrayed in fan fiction. 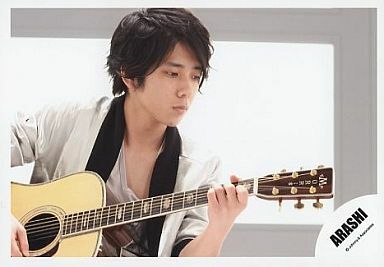 The witty comebacks, the shrewdness… I wonder if they ever approximate the real Nino. 24. He’s a trickster. 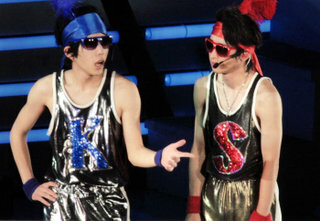 Remember Ni no Arashi? 25. How can I forget, his unabashed love for… okane. 27. Those Devil Nino Pocky commercials. 28. 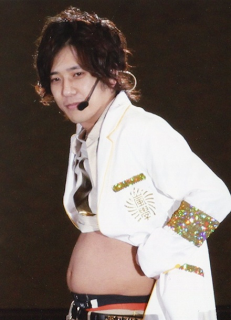 Nino and his devotion to Takeuchi Yuko. I wish you more money, more games, more dramas and films. But most of all, I wish you good health and happiness, and a girl who will tolerate you and let you live your life, pay for your meals and taxes too. Okay, I can almost hear you say: Yamete! Happy Birthday to you too!!!!!! And we who will pray so he can keep his dorkyness, and weird laugh all years to come. (Psst and a new cute obouchama haircut!!! gyaaaaaaaaaaa dead, am dead really). 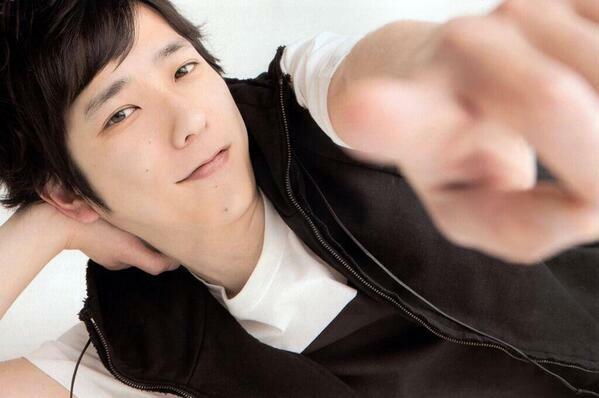 hahaha our Nino birthday wishes are so hilarious. onyl fits the brat! I suggest that you make a post for each member like this one. I really like this kind of post. 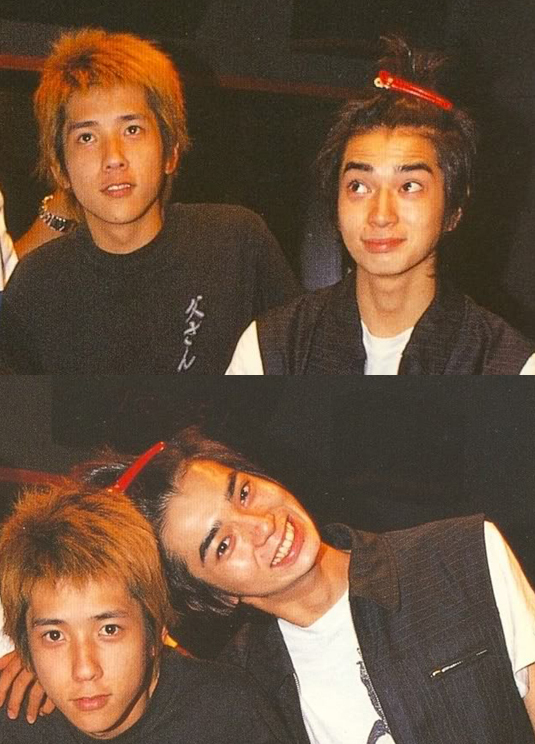 And also the one about Jun’s and all of his nicknames. Uhuh. Well, we really like to know more about these five bakas, aren’t we? Even if we know some of their personalities but we fangirls would like to read over someone’s work, telling us about all of their personalities he/she know about them and keep saying ‘Yeah!’, ‘So true!’ whenever we read it, deshou? And, I guess, you could do that kind of post since you kinda know a lot about them.